it is now two months post op and my symptoms of numbness and weakness are totally gone! The five leading experts with whom I consulted in Los Angeles on my cervical problems who warned me about this advanced new procedure were totally wrong. They all said I had very impressive lesions especially at C2 which made it a difficult operation. Had I listened to them , I would have undergone a conventional four level ACDF with uncertain recovery time and a world of pain and problems. Instead ,five hours after outpatient surgery I had a marvelous dinner and went to the movies. Actually the most excruciating part of the day was sitting through the movie which was bad. I can't thank you and your wonderful and supportive team enough. I am back to a full and active life . As you know I am in the innovation field and I constantly look for better more advanced ways of doing things. It takes the courage of your convictions which you certainly have and an act of defiance to go beyond accepted practice for the betterment of your patients. 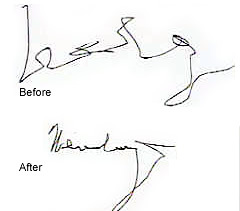 Below you will find before and after <60 days post op> signatures which show my much improved fine motor skills. You may post this to any spinal disorder forum or use as an endorsement of your minimally invasive cervical procedure.